WHO I FISHED WITH: This morning, Monday, June 11th, I fished with Mr. Guy Fowler and his adult daughter, Brook Fowler. Guy has been in the Belton/Temple area real estate business for many years now and is friends with the Covingtons (Terri, Jim, and sons) who are also in that business. Terri presented the Fowlers with a fishing gift certificate some time ago and this morning is when Guy and Brook chose to redeem it. We caught a mixed bag of fish, both in terms of size and species, tallying 90 fish in right at 4 hours on the water. 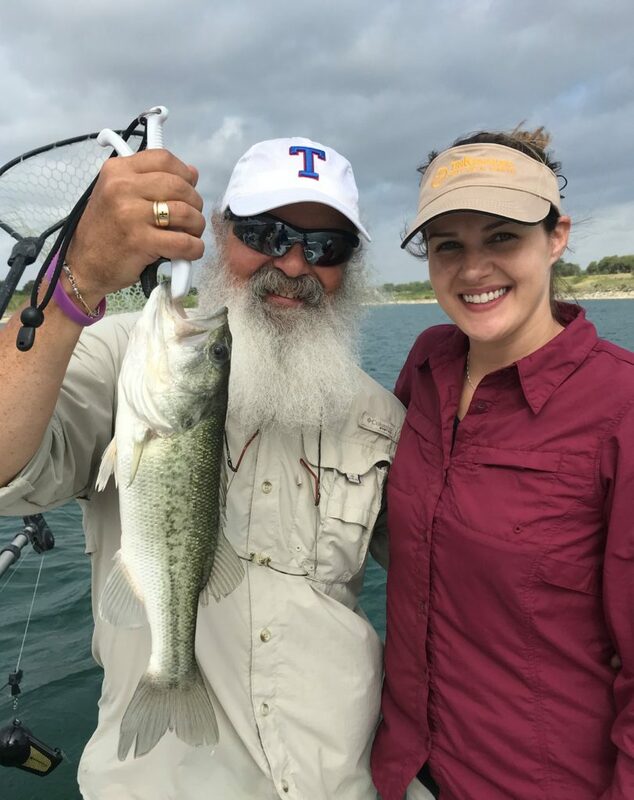 Guy and Brook Fowler took a father-daughter trip away from the normal Monday morning office madness and spent some relaxing time on Stillhouse Hollow this morning. Brook holds the first 2-year class fish we landed on downriggers this morning. As the wind built and the skies brightened, the bite intensified. 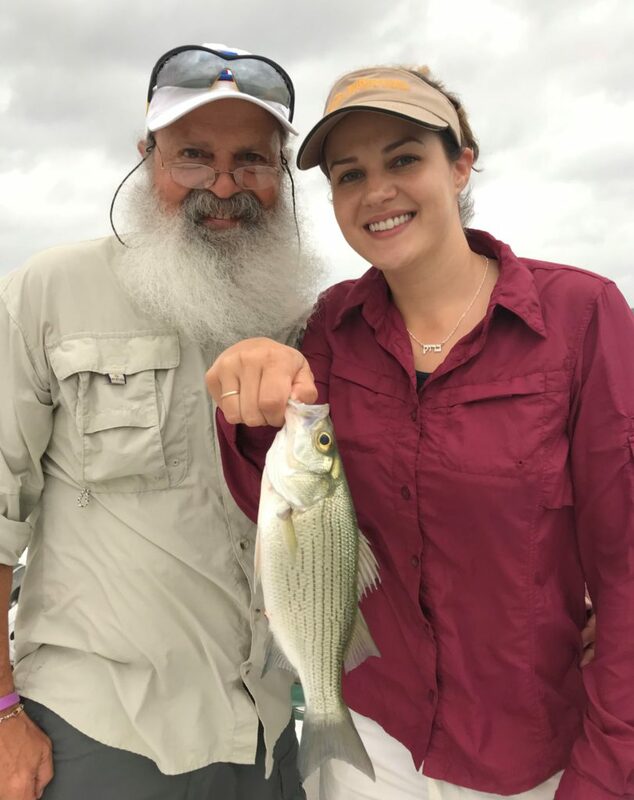 We started off catching white bass, but saw largemouth and drum enter the picture as we worked slabs, tailspinners, and, eventually, some live bait, to keep the bite going. Here Guy holds one of many just-keeper largemouth we landed this morning. WHAT WE FISHED FOR: This was a multi-species trip in which we caught white bass, largemouth bass, and freshwater drum. WHEN WE FISHED: Monday morning, 11 June. HOW WE FISHED: As is typical of heavily clouded mornings, the bite got off to a slower start which ramped up as both the wind and the light level increased. We began our morning downrigging successfully over a 100 yard long patch of bottom adjacent to the old river channel, finding small groups of white bass holding on or near bottom. We used 3-arm umbrella rigs equipped with Pet Spoons to tempt these fish and consistently landed singles, doubles, and even a pair of triples (3 fish on the umbrella rig at one time). After about 70 minutes of productive fishing, which gave up 18 fish, this first area cooled off and we went looking for more fish. Upon arrival at the second area we searched, I observed a brief flurry of topwater feeding white bass driving shad to the surface. I then knew both fish and bait were present, so we combed over the area until we found the “center of mass”. After picking up one white bass on each of the downriggers, I set the Minn Kota into “Spot Lock” and we hovered atop the school of fish sonar had revealed. We got the fish worked up as we dropped our chrome slabs into the midst of them and began a “smoking” tactic to excite them into biting. We had a 40+ fish run of white bass, largemouth, and drum on these slabs before the fish slacked off. We reignited the bite using tailspinners, and when the fish began to turn their noses up at those, we switched over to live shad and continued catching. We landed exactly 70 fish on this one area during this second stop. By 10am, the fishing slowed to a crawl. We searched several areas, picking up just 2 more small white bass and seeing no organized activity, nor congregated fish. We ended the trip right at 10:30am with exactly 90 fish boated. 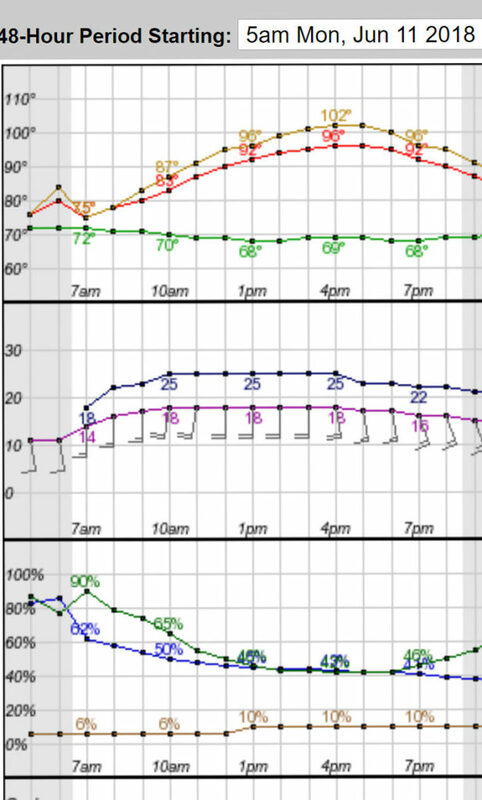 OBSERVATIONS/NOTES: The grey cloud cover and 11-13 mph wind made all the difference today in motivating the fish to start feeding and stay feeding. As far as the white bass were concerned, we did not have fish refuse our offering as we did yesterday under calmer, brighter conditions.